Books may be Mayumi Saito’s greatest love and her one source of true pleasure. Forty-one years old, disenchanted wife and dutiful mother, Mayumi’s work as a librarian on a small island off the coast of New England feeds her passion for reading and provides her with many occasions for wry observations on human nature, but it does little to remedy the mundanity of her days. That is, until the day she issues a library card to a shy seventeen-year-old boy and swiftly succumbs to a sexual obsession that subverts the way she sees the library, her family, the island she lives on, and ultimately herself. Jennifer Tseng’s first book The Man With My Face won the 2005 Asian American Writers' Workshop's National Poetry Manuscript Competition and a 2006 PEN American Center Open Book Award. Her second book Red Flower, White Flower, winner of the Marick Press Poetry Prize, features Chinese translations by Mengying Han and Aaron Crippen. Mayumi and the Sea of Happiness is her debut novel. She works at the West Tisbury Library on Martha’s Vineyard. 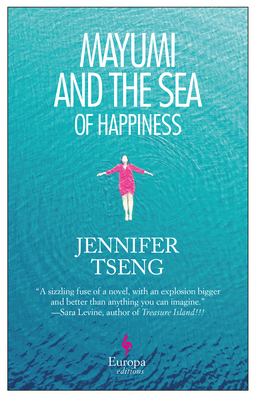 “Jennifer Tseng delivers an elegant exploration of passion and its consequences while casting her observant eye on motherhood, memory, exile, and female friendship. Carnal, witty, and slyly crafted, Mayumi and the Sea of Happiness is a sizzling fuse of a novel, with an explosion bigger and better than anything you can imagine.”—Sara Levine, author of Treasure Island!! !